Medium hair for teenage guys is very comfortable because it allows you to show off your hair while still being able to try all different kinds of hairstyles and haircuts that are not super high maintenance. As you can imagine, there are as many choices out there as there are personal styles. A change of hairstyle is always a good idea, but the abundance of options can make the decision rather difficult, so that’s why I’m narrowing the choices down for you. Here are 10 medium hairstyles for teenage guys to try out. Side short bangs are yet another common option for teens and they offer a carefree, easy option. You can style it however you want and you can add layers for some texture and movement. 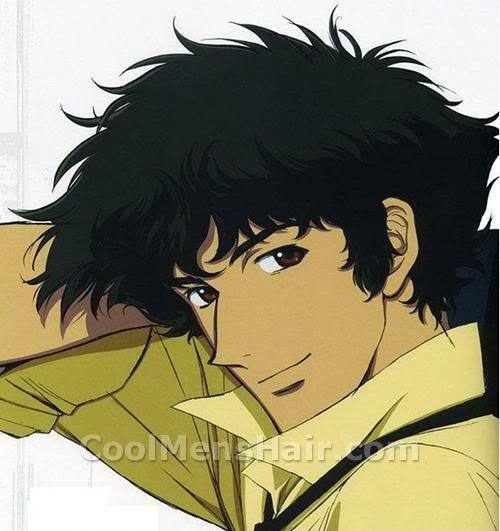 This option is great for teenage guys with medium thin hair, whether that’s straight or curly. Tousled hair makes it easy for teens with naturally greasy hair to style their hair without too much effort and always make it look like it’s on purpose. Messy, tousled hair doesn’t only look good, it’s easy to maintain and easy to style. All you need to do is put some effort into getting the messiness right; it’s supposed to look “orderly” even in its messiness. A little gel can help! 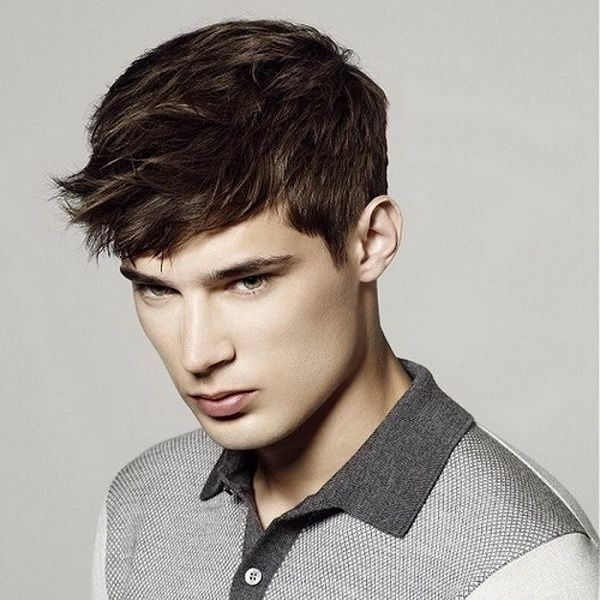 This teenage guys medium hairstyle will look best on curly or wavy hair. The sharp side part hairstyle is a popular option and it offers a sleek, elegant, yet simple choice. The hair is parted by a shaved line and you can couple this with temple fade, just like the picture, so that the part can be the focus. This medium hairstyle for teenage guys allows you to keep the rest of your hair as short or long as you wish. The undercut is another popular option that looks conservative but fashionable and stylish at the same time. The top can remain medium length and layered to add texture, coupled with shaved sides for a clean look. As your shaved sides grow, the undercut will still look amazing, but you can always maintain the hairstyle as originally intended. A high taper is a great option for teen boys with medium hair and it offers a clean, yet fun and free look that will allow you to show off your hair. The long fringe can be layered for texture, as you can see in the picture, and this will look good on curly, wavy and straight hair as well. A pompadour hairstyle is a classic option. It was cool when Elvis Presley did it, and the modern version is cool today, so it’s no wonder that more and more teenagers are going for it. This hairstyle has a flare and it’s very flattering; it also allows you to keep your medium length hair while still looking sharp. Top layers are often featured in medium haircuts for teenage guys because they allow you to show off your hair while still remaining low-maintenance. Couple the top layers with shaved sides, and you have a great look. You can let the top layers rest on your forehead and rock a chopped cut, you can also comb it over or go for a slicked back style whenever you need. James Dean was one of the most fashionable men that have ever lived. In fact, some people might state that there was no one more fashionable, and they would be right. You can pull this off with wavy, curly, thick or medium hair, just make sure you keep the side shorts to maintain the James Dean look. Low fade has become very popular, and for good reason. It looks great and it provides a clean, elegant, yet current hairstyle. For teenage guys who are looking for a medium haircut, this one can be a great choice. 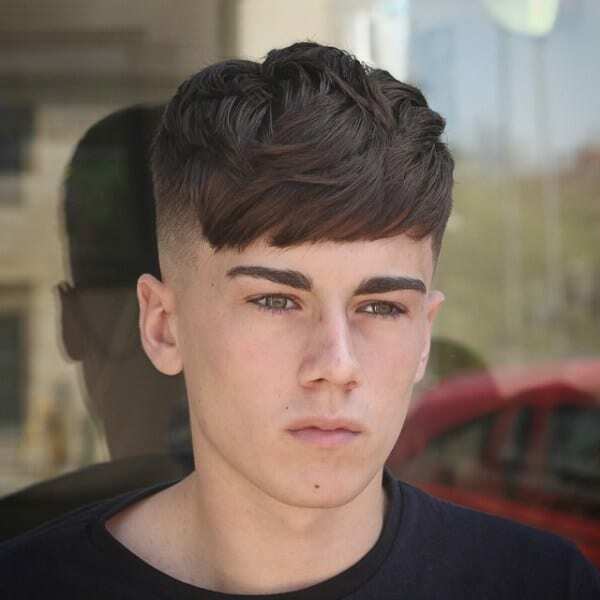 This medium hairstyle for teenage boys offers a relaxed look because there aren’t any blunt cuts, it’s all consistently fading into the shaved skin, which is what makes it look so neat. The comb over or side part is another classic and it looks great on teenage guys. The tapered hair is elegant and it looks super clean. This haircut will allow you to keep your medium hair in a stylish manner and, as you can see from the picture, it pairs well with temple fade. These are the top 10 hairstyle choices for teenage guys to help them define their style however they see fit. Each one of these looks offers a great alternative and they are all very different, elegant, carefree, stylish, classy, and clean. Your hair is one of your main features, which means that choosing the right hairstyle for your personality is very important, so think it through!